I'm always looking for ways to reduce the toolbars and menus to have more space for the websites. I have already written about extensions such as Hide Menubar or the Firefox UI Tweaker that change the appearance of Firefox. The Tiny Menu Extension is another great add-on to this list. What it does is that it compresses all entries from the menu toolbar (File, Edit, View, History and so on) into one entry that lists the compressed items beneath each other. Take a look at the screenshot to get an impression of how this looks like. Some users prefer to have as much space in Firefox for websites as possible. One way to get rid of some of the toolbars and menus temporarily would be to press F11 which removes the title, the bookmarks toolbar and the menubar. Another way would be to just remove the menubar which is not needed most of the time anyway. To do that you simply need the Firefox extension called Hide Menubar which removes the menubar once installed. 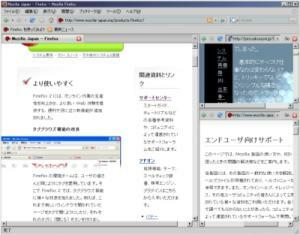 Some users are switching between Firefox and Internet Explorer on their computer depending on the task at hand. It is for instance essential for webmasters to check their websites in the most commonly used web browsers. I thought it would be nice to share bookmarks between Firefox and Internet Explorer to use the same bookmarks in both browsers. This can be done easily with the Firefox extension Plain old Favorites which adds the favorites from Internet Explorer to Firefox. The favorites menu is placed next to the bookmarks menu in Firefox. I'm still using Firefox and I thought it would be nice to share some advanced configuration tips that helped me a lot with you. This article was inspired by Lifehackers Top Firefox 2 config tweaks but adds advanced tips to the mix. Rest assured that the configuration tweaks will not list the same tips that you see on every other site nowadays, I promise new unseen tips. Google displays 10 search results by default which is probably enough for most users who statistically use the first ten results most of the time ignoring the rest of the results. I on the other hand tend to view more than one page normally and was looking for a way to increase my productivity by displaying more than 10 results on a single search result page. I found a Greasemonkey script which changes the value from 10 to 100 for normal Google searches. If you have hundreds of bookmarks in different folders like I do you might know the problem that bookmarks are added from time to time that already exist in your list. It is not that easy to manage the bookmarks and keep an overview over them all. A complicated folder structure with many subfolders is adding to the problem. It really does not help to check your bookmarks manually every know and then, this takes to long and does not prevent that duplicate bookmarks are added at a later date again. The Firefox extension Bookmark Duplicate Detector is helpful for users with a lot of bookmarks. It is not that easy to download all images from a page with many images in Firefox. It would be possible to use a download manager or wget to get all the images but this would mean that you would have to rely on external tools and know how to use them. A far easier method is to use the Firefox extension Batch Downloader. It does exactly what the name suggests, it downloads all images that have a resolution of 200x200 or more in one batch to your hard drive. I took a quick look at the Gspace extension for Firefox in 2005 and it happened so much that I thought it was a good idea to take another look at it. Gmail gives its users lots of space, currently about 2.8 gigabytes of it which is of course to much for most mail accounts and this is where the Gspace extension for Firefox steps in. It basically makes it possible to use gmail storage in a way to store files online which seems a lot securer in my opinion than using a file hoster. The interface looks similar to most ftp clients out there, it should not be a problem getting used to gspace quickly. We all know that it is possible to load more than one default homepage in Firefox by separating each page that should be loaded at startup with a "|". If I wanted to load ghacks and Google by default I would add https://www.ghacks.net/ | http://www.google.com/ in the home page tab of Firefox. So you have come to a website with many galleries that have a similar naming convention ? You would like to auto-navigate or automatically download all of the images without having to repeat the same step a hundred times ? Flipper, a firefox extension, could help you automate the task. It is not that easy to use on first glance but it becomes clear after using the test gallery which was setup by the author of the extension. Flipper is working the following way: You click on the first image of the first gallery and hit CTRL + END afterwards which opens the configuration window of Flipper. Many users seem to have the feeling that the memory consumption of Firefox seems to get out of hand after a certain perdiod of continued web browsing. It is however not that easy to determine the exact cause that seems to slow down Firefox after a while. I try to give some insights in possible solutions to those slow downs - they might help in some cases but could change nothing in others. I'm using the Tab Mix Plus Firefox Extension for one simple purpose mainly. I don't like the way Firefox handles if you open more sites in tabs than the width of your screen can display. The default way is that Firefox makes the tab list scrollable which is not a perfect solution. I was looking for an extension that would create an additional row and place all the new tabs in that row. Tab Mix Plus supports this feature, you can select the maximum number of rows that should be added, the default value is three rows which means that two additional rows will be added if necessary. Sometimes the small changes make a huge different. How would you normally open a link in a new tab ? Right-click it and select Open link in new tab ? Left-Clicking it could mean that it would open in the active page or load a new window, both could be undesired.